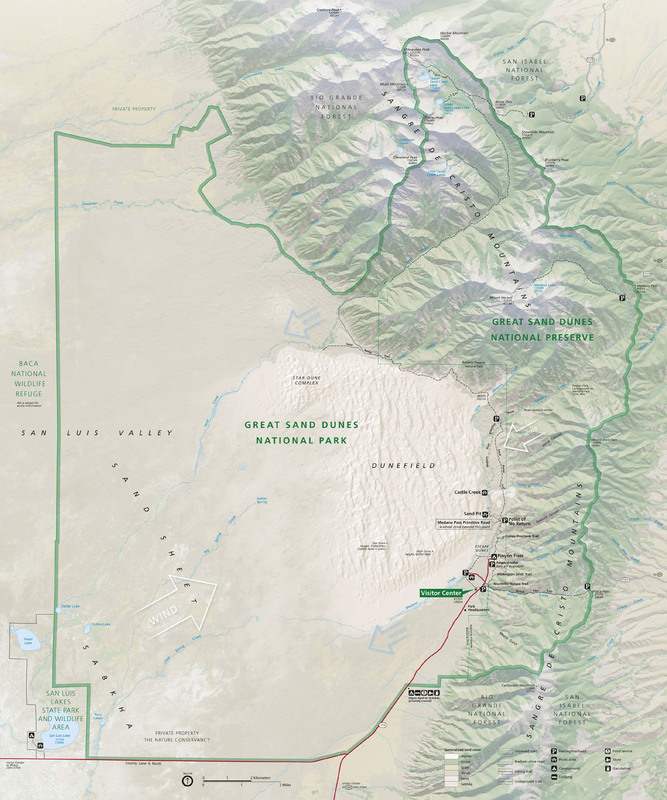 ALAMOSA, Colo. — My feet are just now thawing out after adventuring in the Great Sand Dunes more than seven hours ago. We concluded today (Day 6, Saturday the 28th) at the Dunes. Well, actually we just returned from Pizza Hut, which is apparently the only restaurant that offers anything vaguely resembling Italian cuisine in Alamosa. But anyway. At the Dunes (where we didn’t have to pay an entrance fee, as was the case with Black Canyon of the Gunnison), we took the road all the way to the primitive, four-wheel drive section which ended at the Sand Pit. From there, we crossed the creek, which is how my feet — shoed only in Chacos and socks, once again — came to be so wet and cold. I’m pretty sure that water was just above freezing. And then we adventured around the dunes until a little after sunset. And now our socks and shoes/sandals are still damp and sandy and gross-smelling. But no regrets. 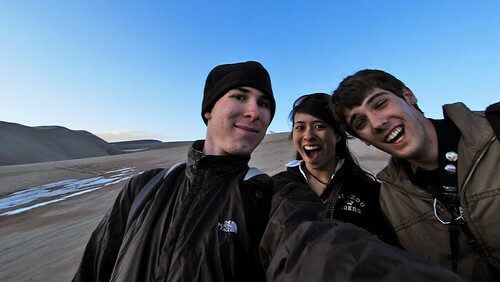 L-R: Jeff, me and Esten at the Great Sand Dunes! We look ridiculous. Photo by Jeff. IN REFLECTION — So tonight is our last night on this epic spring break roadtrip, and tomorrow we make the very long drive back to Columbia, Mo. We guesstimate the drive to be about 14 hours, and none of us is looking forward to that or to schoolwork. Approximately 3,000 miles from start to finish. Seven days and six nights on the road. Two pairs of jeans for me. They were both pretty ragged already anyway. Two nights of camping, although originally we were supposed to have three. Four national parks and one state park visited in six days. Fourteen cameras among the three of us. Six flash units/strobes among the three of us. Who knows how many batteries, memory cards and rolls of film among the three of us. If anything, this trip has both pacified and exacerbated my desire to explore and take photos and travel. Having spent the greater part of the past three years either in Columbia or New Mexico (and the past 20ish years in Houston, Texas), I’ve developed a case of cabin fever… which is only part of why I was so excited about this roadtrip and am so excited about spending this summer in Washington, D.C., as an intern for washingtonpost.com. At the conclusion of this roadtrip, I’m happy that we were able to complete our itinerary as planned, with the exception of Kodachrome Basin and camping out in Black Canyon. But: I didn’t think it could happen, but I’ve fallen even more in love with the West than I thought possible. My thirst for photo adventuring has only been further whetted, and now I know I have to return to the West sometime, to explore it more thoroughly. I have no idea when I’ll have both the time and funds for such an extended photo adventure, but I know it has to happen. So who knows when I’ll have the time and energy to edit all the photos I’ve taken? But I’ll try to start posting photo entries by this weekend. In the meantime, I’m so glad we could have a week-long photo adventure in the great American West. Peace, y’all, and next time I post to this blog, I’ll be back in Missouri!